Initially the rights to Docklands were sold to Colonial Mutual for 32.5 million over ten years. When Colonial was bought by the Commonwealth Bank, those rights were sold to Telstra for $50 million. Colonial Stadium became Telstra Dome. In 2009, Etihad Airways paid $25 million for the naming rights to the stadium, triggering legal action by the AFL as this conflicted with its major sponsor, Qantas. The AFL said that its contract gave it veto rights over naming rights sponsorship, and threatened to not allow its various arms to refer to the stadium as Etihad. That legal action is detailed here. The situation was settled out of court, and the deal was renewed in 2012 until 2019. 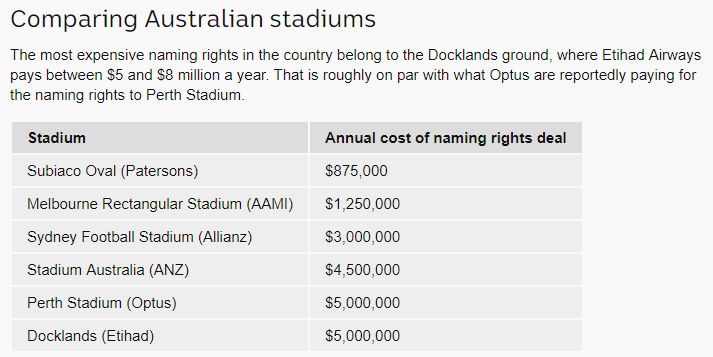 In 2017, it was reported that Etihad Stadium naming rights were worth between $5 and $8 million dollars per year, making it liekly the most expensive naming rights for a stadium in Australia.. In May, 2018, Melbourne Stadiums Limited and Disney announced an 8 year deal that would commence on September 1st, resulting in the ground being called Marvel Stadium. No value for the deal has been announced.